If you enjoy the rich, crystalline blues that make Caribbean getaways so spectacular, then you should love aquamarine, the traditional birthstone for the month of March. As a matter of fact, aquamarine's name, derived from Latin, is a function of its color and means "water of the sea." Aquamarine, however, pre-dates even the Roman Empire and has been highly prized for thousands of years. Revered for its oceanic colors, it was also considered by the ancients to have a number of very special qualities. Some felt it would improve one's courage or increase wisdom, while others felt it would help strengthen the bonds of lovers and married couples. A timeless stone, aqua's popularity and mystique have continued to grow over the centuries. A member of the beryl family, aquamarine has a very famous relative called emerald. While both are chemically similar, aquamarine derives its color from trace amounts of iron. Ranging from soft pastel blues to intense dark blues and blue-greens, aquamarine is an exceptional choice for the March birthstone. Much of the world's supply of aquamarine comes from Brazil, mostly from Minas Gerais (Portuguese for "general mines") in the southeastern portion of that country. However, fine aquamarine material also comes from the Brazilian states of Espírito Santo and Ceará, as well as other exotic localities like China, India, Mozambique, Namibia, and Zambia to name a few. While trade names like Santa Maria and Maxixe are associated with some of the finest darker blue aquamarine, the gem is enjoyed in a wide range of shades. 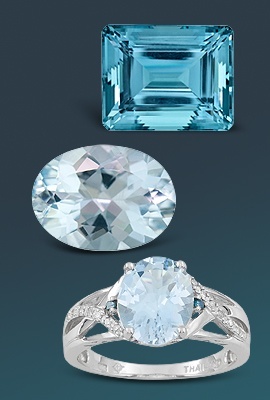 The most important factor in valuing aquamarine is color, and as the color intensifies, so does its price. One nice feature of aquamarine is that most material in the market is extremely clean and transparent. Aquamarine is more than just the birthstone for March; it is also associated with two signs of the Zodiac, Pisces and Gemini, as well as the planets Uranus and Neptune. And to top that off, this symbolic gem is also the anniversary stone for the 19th year of marriage. As times have changed, so have views about colored stones. While some individuals prefer the traditional diamond for an engagement ring, it is not unusual to see color--sometimes aquamarine--in a lady's engagement ring. Many contemporary jewelry pieces also incorporate aquamarine into the design. No longer just a birthstone, aqua is often found in more than rings. As the desire for color has grown, rich and varied styles of earrings, pendants, bracelets, and other forms of jewelry have been created featuring aquamarine. If you happen to be a nontraditional type, you may want to consider rich blue topaz in place of aquamarine. Sporting all the color and beauty of aquamarine at a fraction of the cost, blue topaz is an excellent option if you need a more affordable gemstone. Should you prefer a color other than blue, you may also want to consider another alternative birthstone for March: bloodstone. A member of the chalcedony species and a cryptocrystalline form of quartz, bloodstone exhibits a rich green color with a dazzling array of red spots. Generally opaque, bloodstones are cut with flat bottoms and domed surfaces, referred to in the gem trade as cabs (or cabochons). Whatever your choice, March is an exciting month! Indulge yourself and take advantage of our great selection of aquamarine jewelry and loose gemstones at Jewelry Television®.